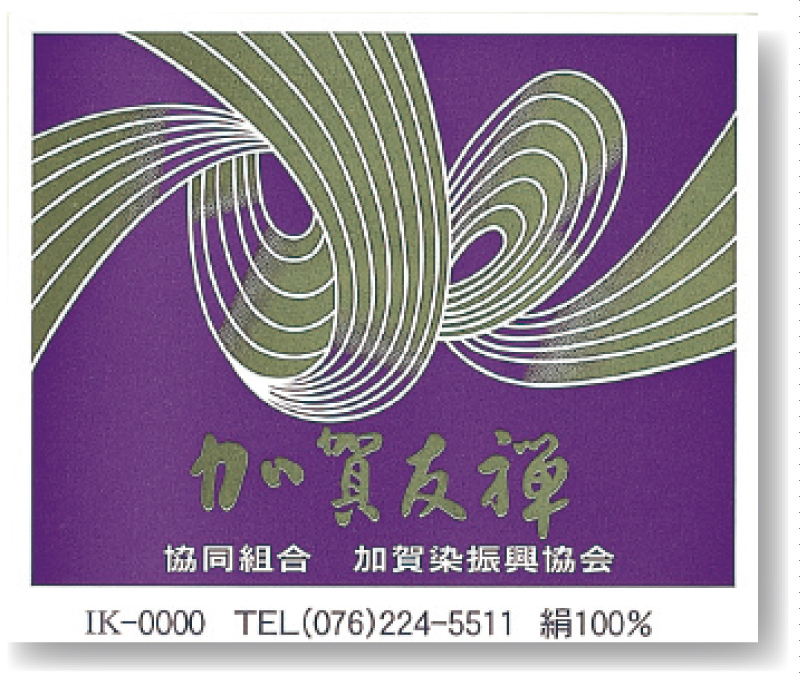 The history of Kaga Yuzen dyeing dates back 500 years, to when Umezome (plain dyeing) was the distinctive dyeing technique of the Kaga district. 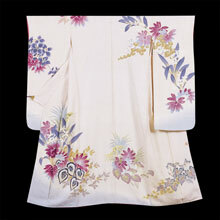 In the mid 17th century, pattern and picture dyeing were introduced to produce elegant designs, and those techniques evolved into today's Kaga Yuzen dyeing technique. 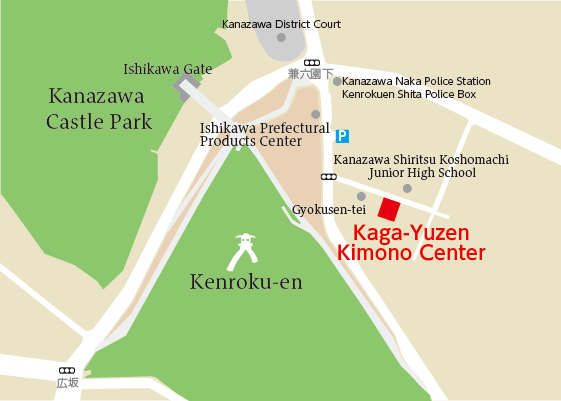 In 1712, Yuzensai Miyazaki, a noted designer of fans, came to Kanazawa from Kyoto as a designer and dyer of the Tarodaya dyeing house. 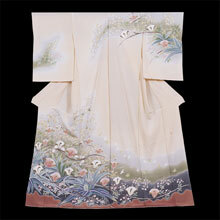 With his outstanding skill in dyeing using paste, he contributed greatly to the development of Kaga Yuzen dyeing. 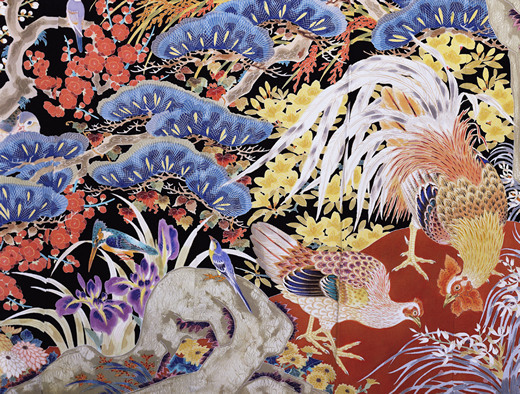 Kaga Yuzen dyeing flourished in Kanazawa under the patronage of the feudal lords of the Kaga district, and the city produced many outstanding dyers and designer. 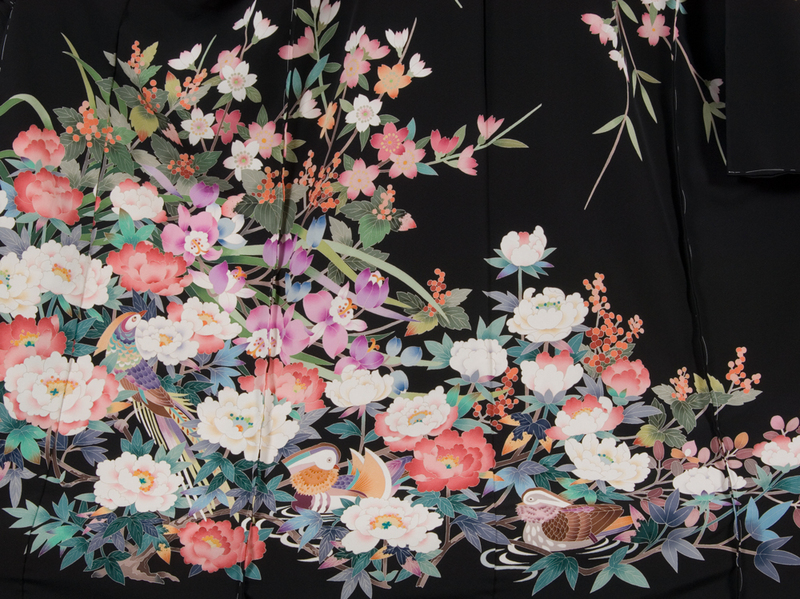 Kaga Yuzen uses five basic colors; indigo, crimson, ocher, dark green and royal purple, and the designs depict beautiful elements of nature such as flowers, birds and landscapes. 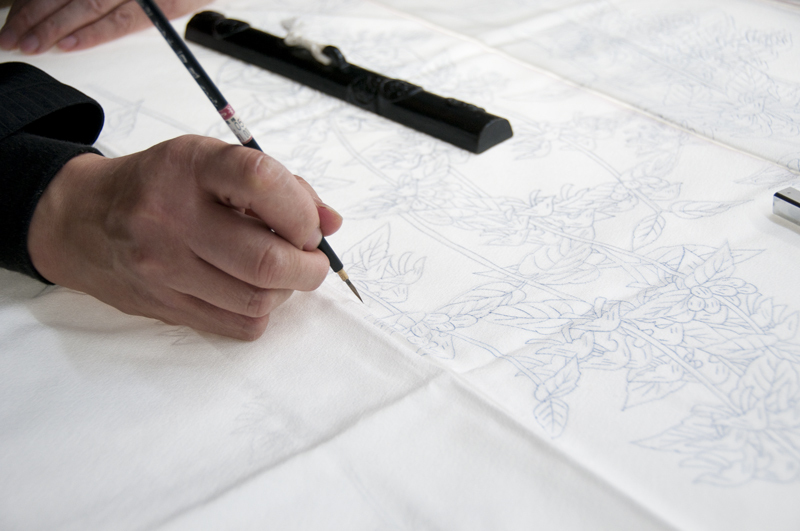 The dyeing style is characterized by the technique of shading from the outside to the inside of the patterns, and by realistic motifs such as plants and flowers with leaves bitten by insects. 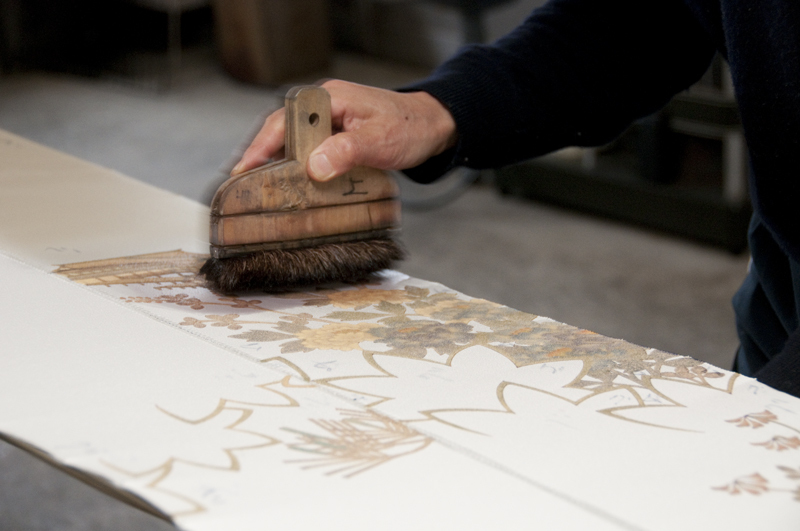 The fact that techniques such as gold leaf application, tie-dyeing and embroidery are seldom used in Kaga Yuzen dyeing distinguishes it from Kyo-Yuzen (Yuzen dyeing in Kyoto). 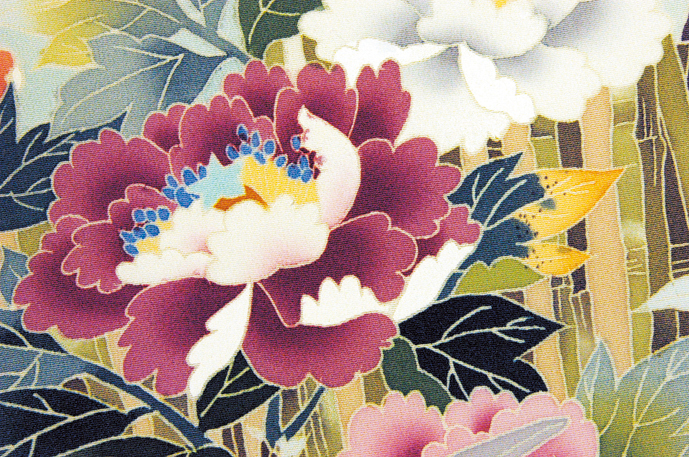 The designs used in the traditional dyeing technique of Kaga Yuzen highlight the delicacy and elegance of the Japanese spirit. 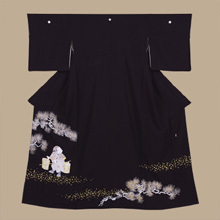 The Kaga-gosai, or five Kaga colors that are the base colors of Kaga Yuzen, are indigo, dark crimson, yellow ocher, grass green and ancient purple. 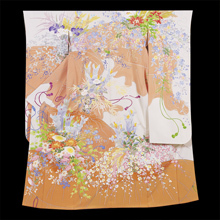 Contemporary Kaga Yuzen artists decide on their color scheme based on Kaga-gosai, reflecting the trend of the time or their own personal preferences. 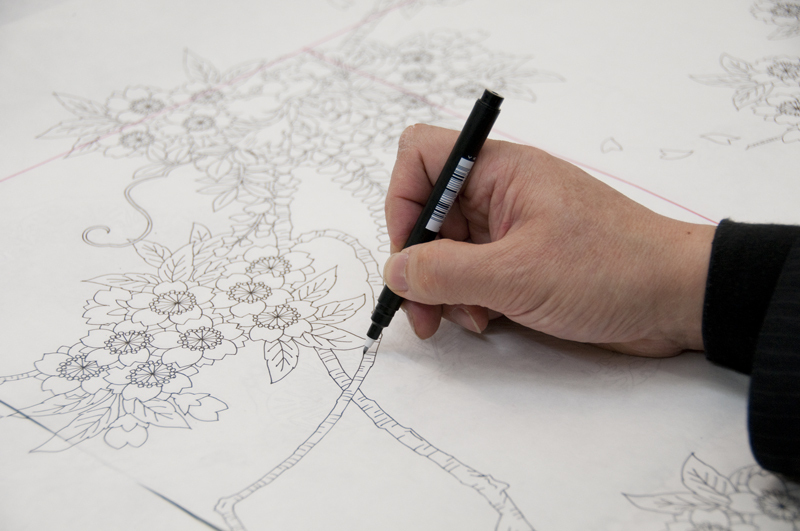 The process consists of nine main steps, all of which require a high degree of skill. 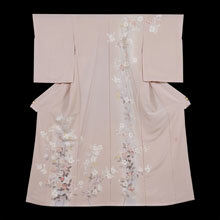 As it takes both time and patience to complete each hand-dyed piece of Kaga Yuzen, the art is highly valued. 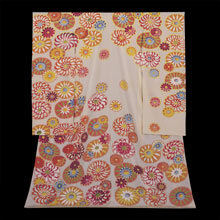 Undyed fabric is placed on top of a design and lit up from below. 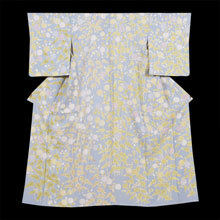 The design is traced with the juice of an Asiatic Dayflower called aobana. 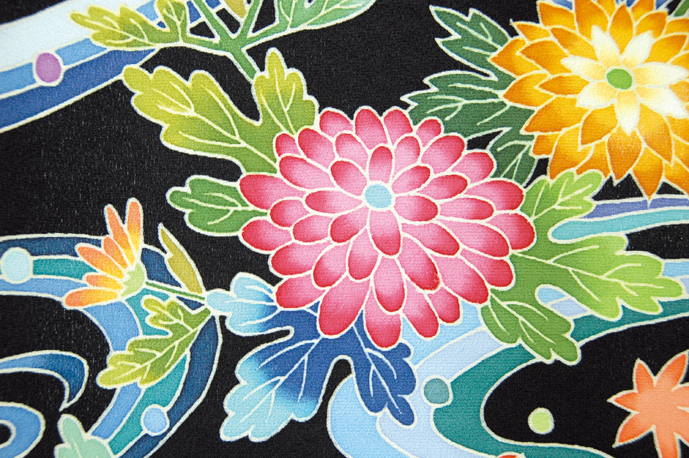 When the fabric is rinsed in water later on, the aobana color disappears. 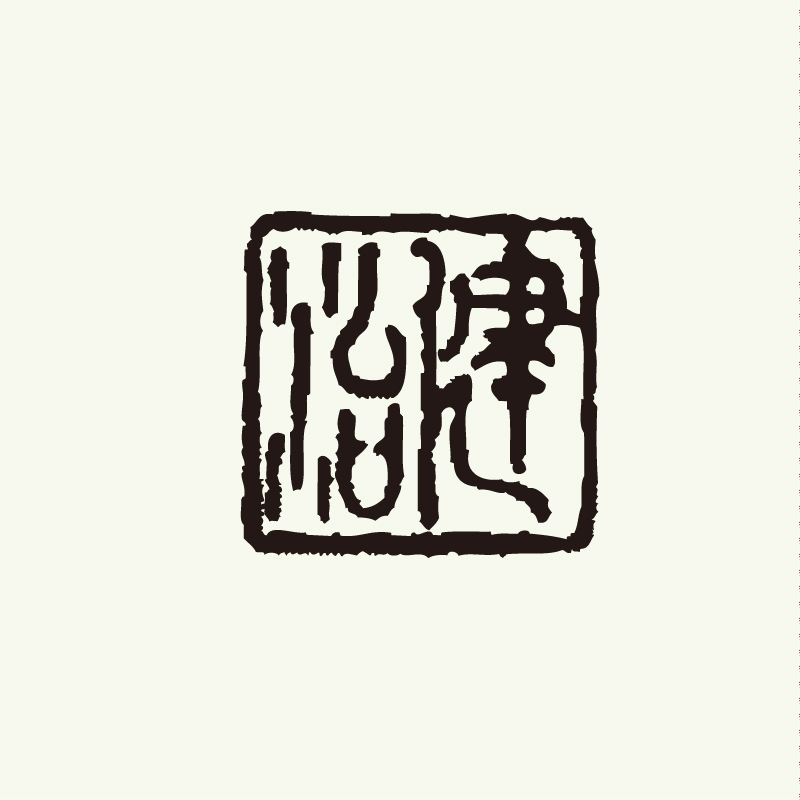 Paste made from steamed glutinous rice powder is squeezed out of a piping bag onto the thin lines drawn in the previous step. 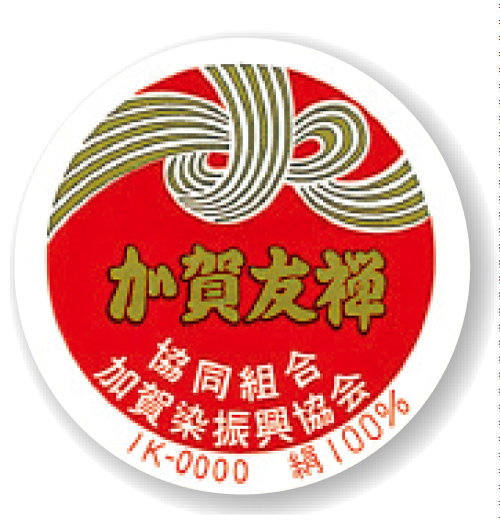 This paste, whose purpose is to prevent dyes from running in the next step, is called itome-nori. 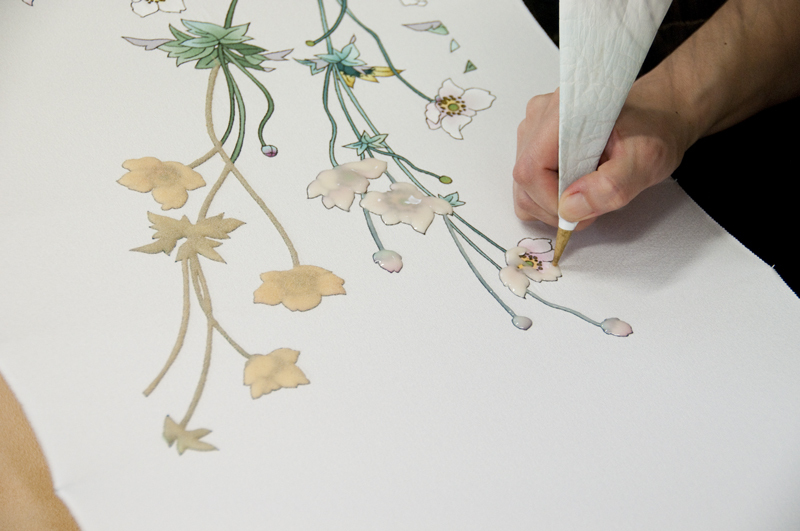 A variety of colors are applied inside the paste outline with several kinds of brushes. Advanced techniques and a strong sense of color are required. 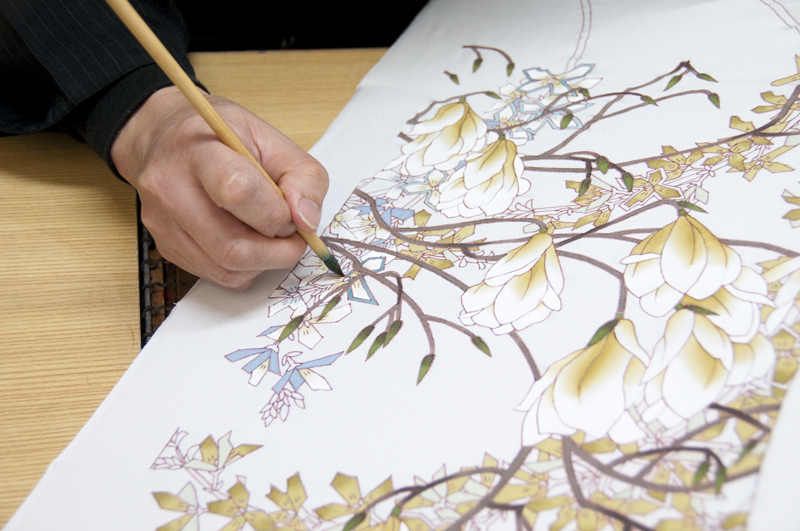 The colored parts are coated with paste so that they can retain their colors when the background is dyed in the next step. 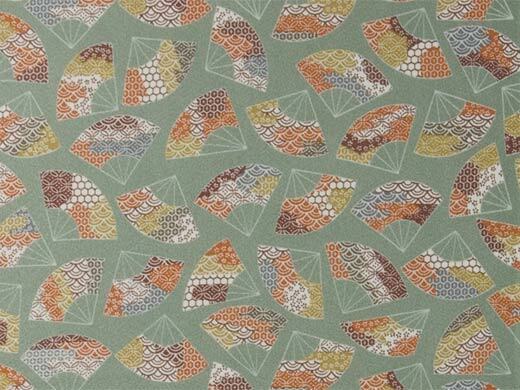 The next step is to dye the background with a brush. 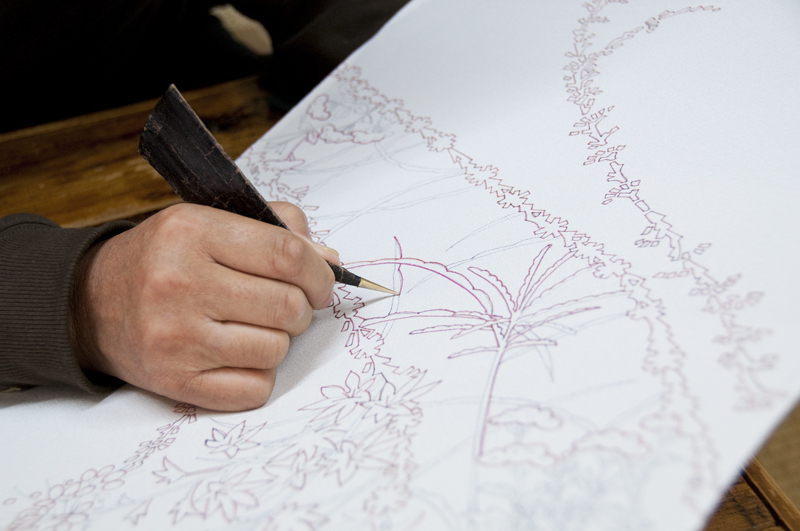 It takes concentration, experience and skill to dye it evenly. 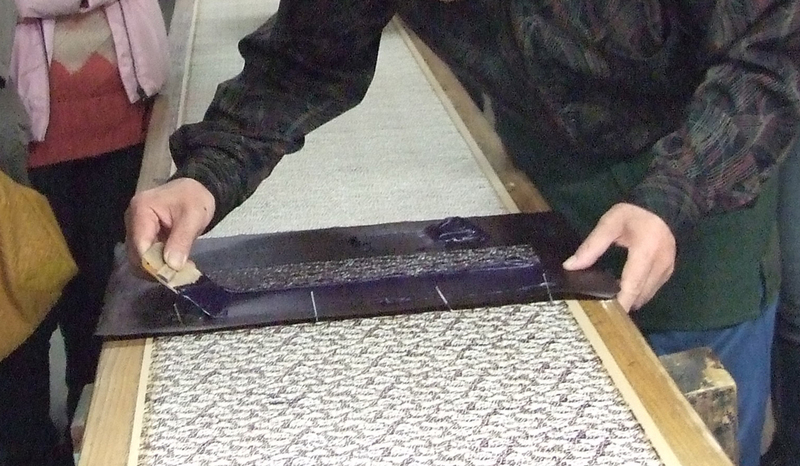 The itome-nori, fuse-nori and excess dye are washed away in running water. 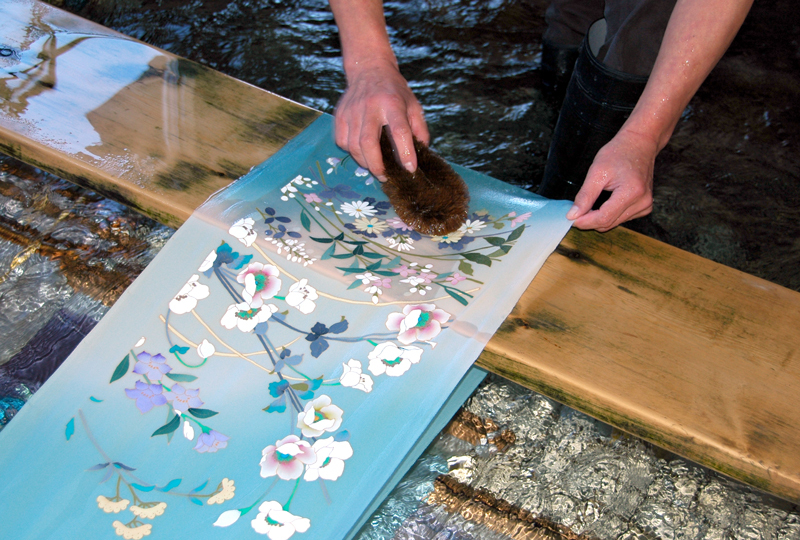 Yuzen-nagashi, or the spreading out of dyed fabrics in the clear, cold running water of a river, is one of Kanazawa’s special wintertime attractions. 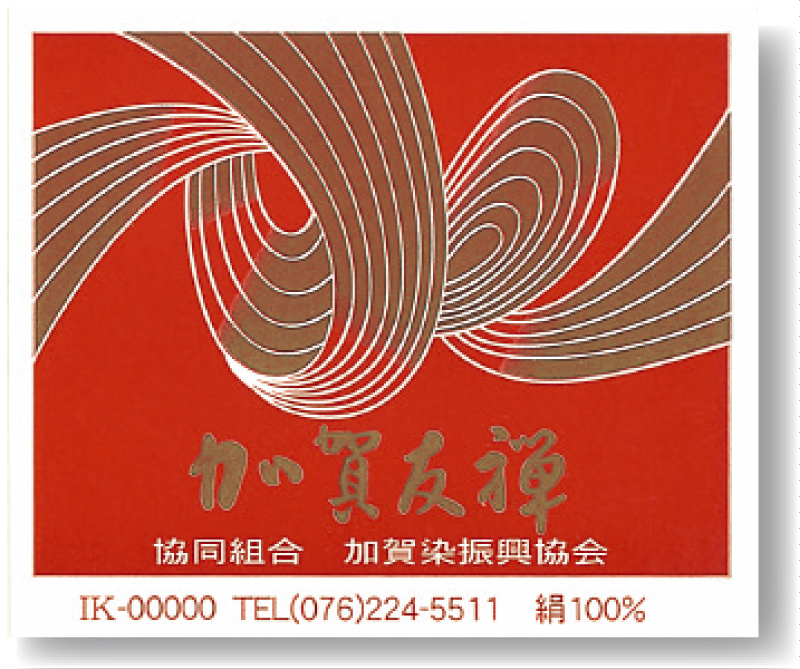 Itaba Yuzen is a fabric-dyeing technique that involves the use of paper patterns with incised designs. 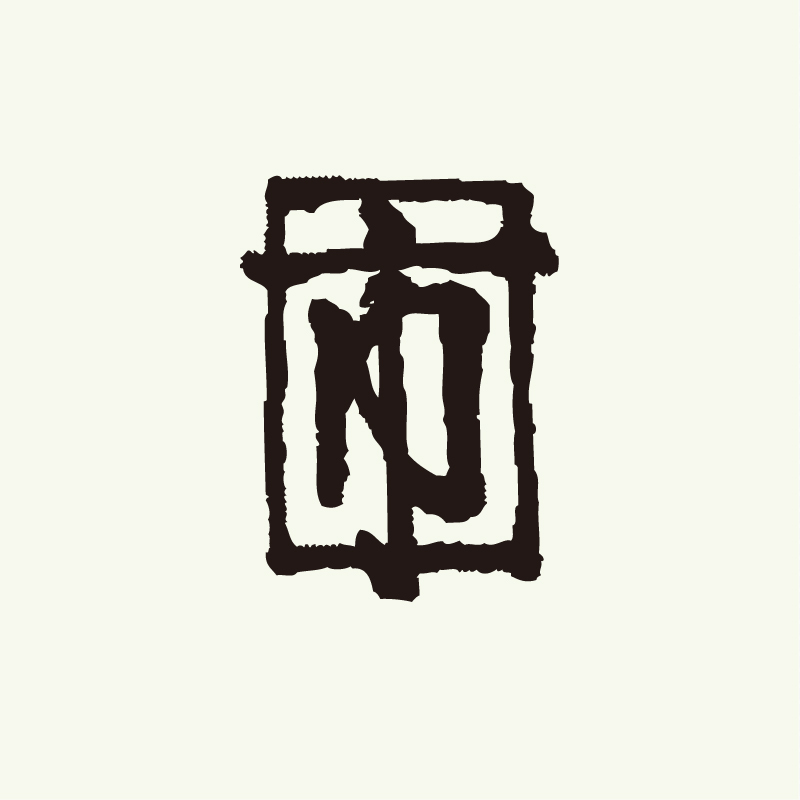 The technique is also called Kata-yuzen or Kaga-komon-zome. 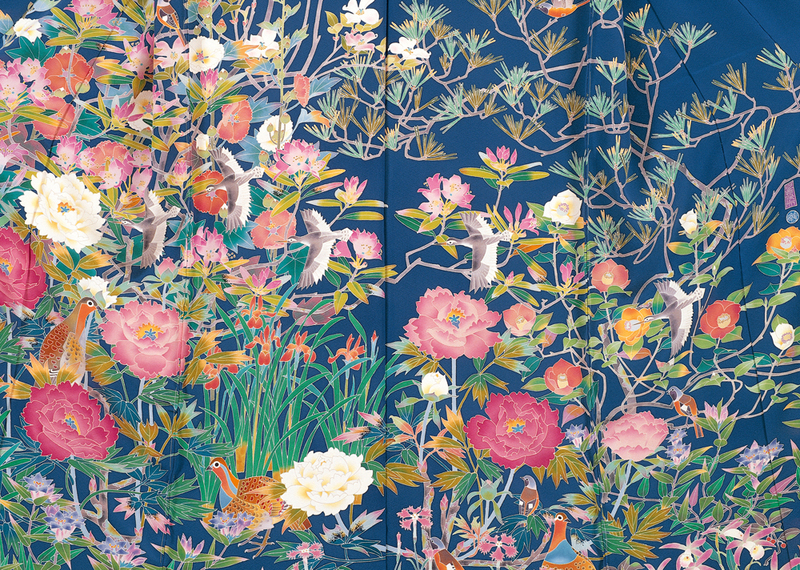 The fine, intricate patterns created by means of advanced techniques are popular for their charm and texture, which are different from those of hand-dyed yuzen. 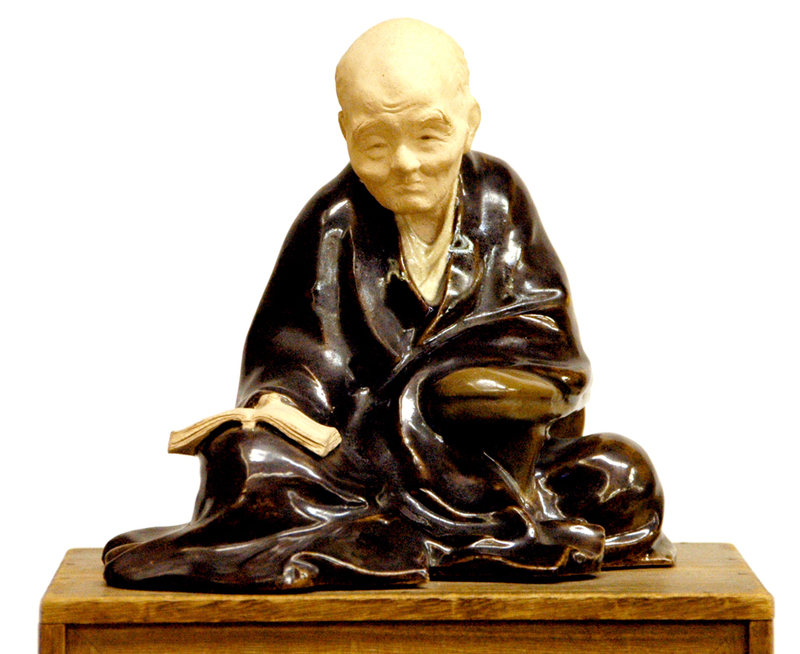 The works exhibited are by some of the great masters of Kaga Yuzen such as Kimura Uzan, who has been designated as a living national treasure. 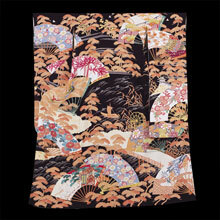 Kaga Yuzen artists are so-called “meisters” accredited by the association. 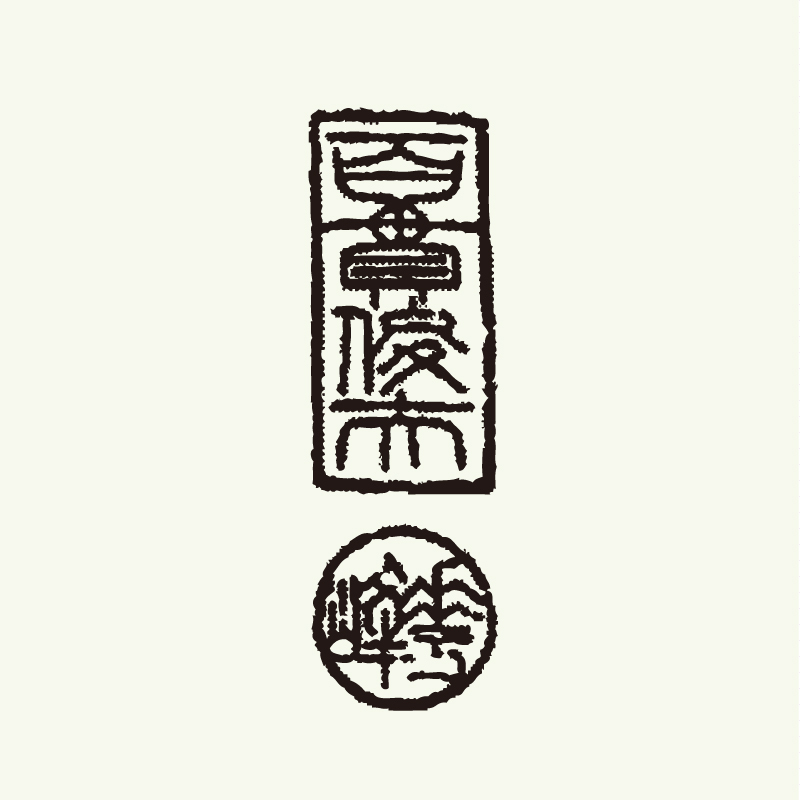 Their works have their seals on them. 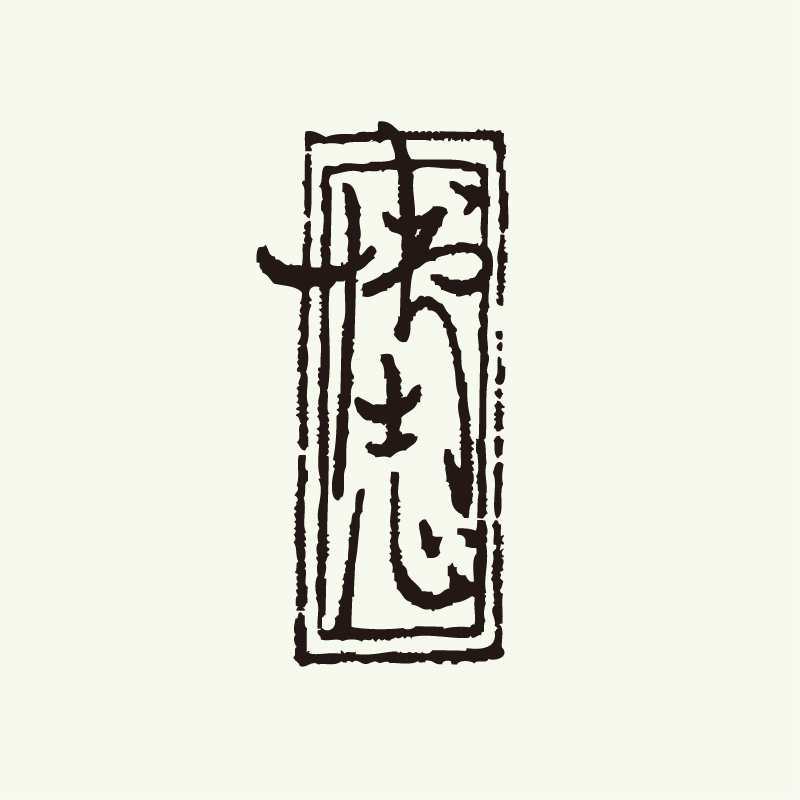 This stamp is attached to all Kaga Yuzen kimonos. 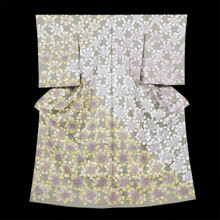 It is always attached to Kaga Yuzen kimonos and related articles. 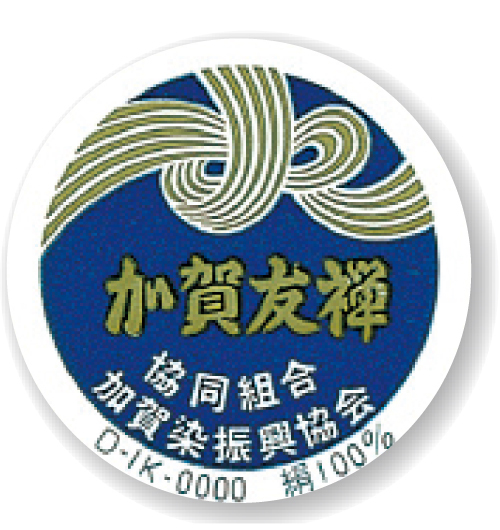 The certificate stamps vary in color and design depending on the type of product. 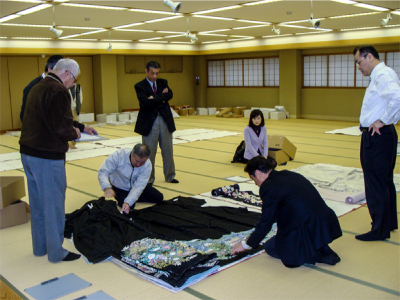 Product inspection is conducted on a regular basis. 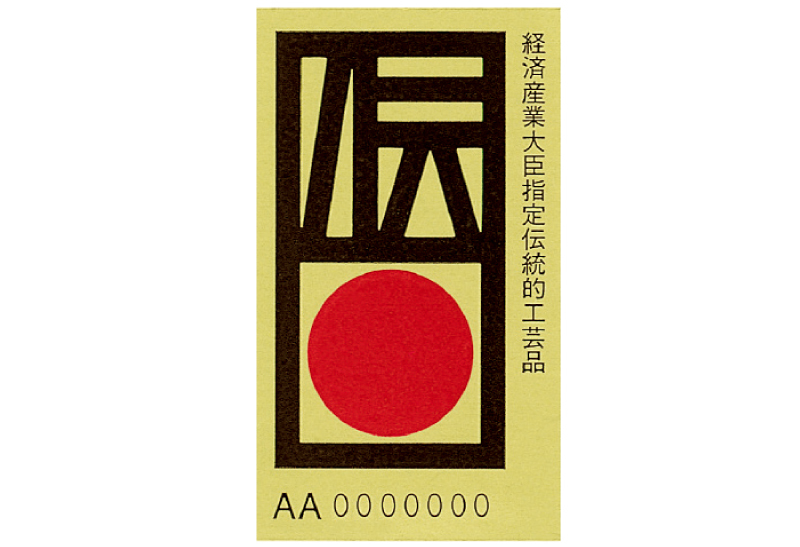 The certificate stamp is only attached to products that have cleared the inspection.